Committee members Barbara Berka and Pat Albrecht spent an informative morning with Jim Igoe, executive director of Preservation Worcester, as he led us through the process of having the building placed on the National Register of Historic Homes. 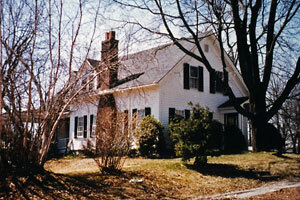 Our interest centered around Goddard's birthplace located on One Tallawanda Drive. He was born there on October 5, 1882, in a second floor bedroom of the then Maple Hill Farmhouse, owned by his family for generations. When he suffered a recurrence of pulmonary tuberculosis in 1913, Goddard recuperated on the wrap-around porch where he spent the summer healing himself. The cherry tree, which he climbed on October 19, 1899, resolving to devote his life to rocketry was located to the rear of the house, but unfortunately, the tree was felled by the hurricane of 1938. The house is currently owned by the Goddard Association's chairperson, Kitty McNamee and her son. In order to be eligible to be placed on the National Register of Historic Homes, the house must meet the following requirements: It must be at least fifty years old; considered to be historically significant; an architectural historian must survey the property to determine that no major changes have been made to the original structure; and this survey must be accepted by the Massachusetts Historical Commission and ultimately by the National Historical Registry for its final approval. Jim Igoe is guiding us through the process. Mr. Igoe states that it is a "travesty" that the birthplace of "the most notable person to come from Worcester" has not been placed on the National Register, and he whole-heartily supports the Association's efforts.